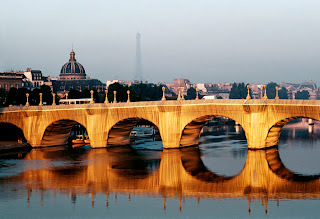 Christo was Belgian born as Christo Javashev during Jeanne-Claude's (born as Jeanne-Claude de Guillebon) birth in France. Being both born on June 13, 1935, they seemed as if in the hands of fate when they met on an October day in Paris at the age of twenty-three. Staying together through thick and through thin, they had a son named Cyril in 1960 and then shortly moved to the United States in 1964. As their lives unfolded before them, they began pursuing art in the most imaginational ways by using the world as the canvas. 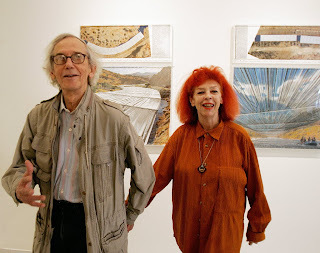 On November 18, 2009, at the age of seventy-four, Jeanne Claude completed her very full and inspiring life as an artist, a mother, and the other half of Christo. She left behind many magnificent works, allowing her to still influence the world today. Part of what made this work so special, to the artists especially, was the effort taken to get it there. 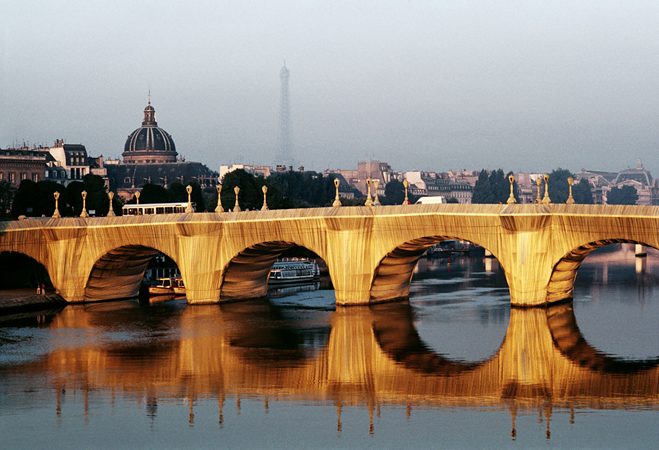 They were persistent with the Mayor of Paris and the President of France for ten years before they were granted permission to wrap the ancient bridge to show the unique joy of nothing lasting forever. They conceived this idea in 1975, but it was not completed until 1985. 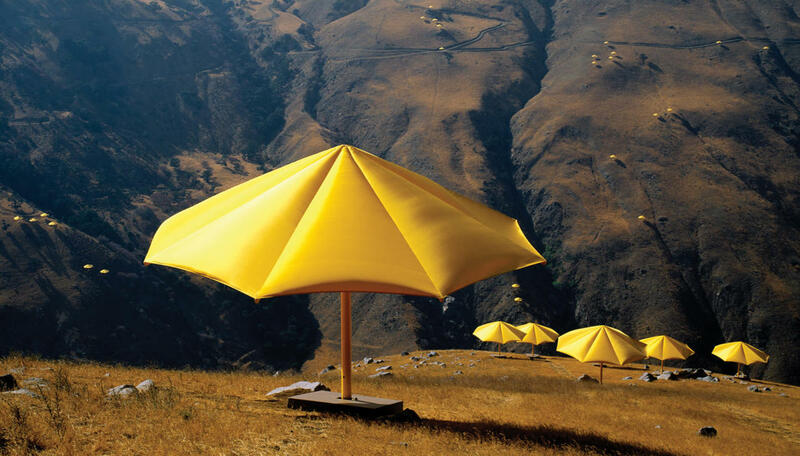 The Umbrellas cover two inland valleys. One is twelve miles of Japan and the other is eighteen miles of the United States. This work took place from 1984-1991, after the bombings of Pearl Harbor and Nagasaki and Hiroshima. This was based off of these major disagreements and was used to express the similarities and differences in beliefs and the ways of life of the separate nations. From 1980-1983, Christo and Jeanne-Claude produced this 6.5 million square feet of hot pink art around the islands of Biscayne Bay. They not only made this environment prettier but cleaner and healthier, too. 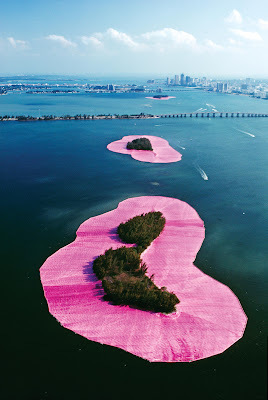 Before ever touching these pink sheets to the water they cleared with scientists that it would not harm the environment but also guaranteed them that they would try to clean the islands up as much as possible prior to and after the job. This project added to the success of this dynamic duo by accomplishing the goal of bringing joy to yet another community. This very interesting portrayal of the overwhelming joy of life is brought to the world in a very interesting way. These twenty-three miles of bright orange gates that bright up central park in a way that nothing else could came to life from 1979-2005. 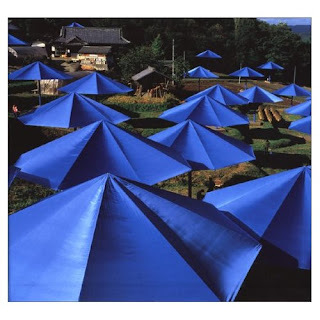 This is perhaps one of the most famous actions of Christo and Jeanne-Claude to America. What significance, if any, does your subject have to the American culture? Over the years, Christo and Jeanne-Claude have not just impacted America and its culture, but they have changed it. They each have added their own sense of creativity, joy, and outlook on life. They have greatly expressed the importance of freedom and the cries of hope throughout each work of art. Differences of the world and the individual point of views have been witnessed by many individuals and even countries. Christo and Jeanne-Claude, like many other artists, have changed the perspective on the everyday of American culture and turned over a new leaf of hope and imagination. What are some major themes that your subject adresses? 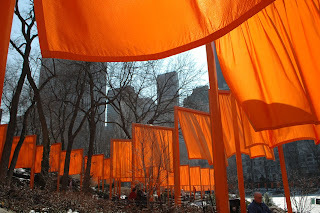 "The work of art is a scream of freedom," confessed Christo. Behind each piece of art ever created there is more to be found. Art is the way of expression, of free, indifferent memories rushing to the surface. This dynamic duo shows the world that no matter how difficult anything may be that there is hope and all is possible. These are some of the many themes portrayed along their canvases of the world. Is your subject responding to another cultural movement? If yes, how? In a way Christo is responding to the communism that was going on in his home country of Belgium in the 1950s and the 1960s. He, Jeanne-Claude, and their son moved to the United States to escape this in 1964. He continued to portray his feelings of the newfound freedom but also the lack of control and hope had previously through his masterpieces. This was so cool and intresting to read, I had no idea before this that artists had to get permission before doing something like, The Umbrellas and The Gates. I really liked the pictures you selected. I find it really interesting how unique the large scale wrapping and public creations were. It's amazing how committed they were to their art. To know that their art work would be viewable for ony a short period, and to still put the time, creativity, and resources into its creation, shows how strongly they believed in what they were doing.